One of the exploration drill rigs targeting Kamoa-Kakula-style copper mineralization at Makoko on Ivanhoe’s 100% owned Western Foreland exploration licences. 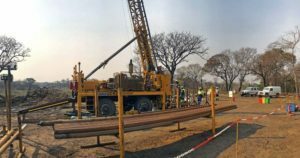 Ivanhoe Mines Ltd. [IVN-TSX; IVPAF-OTC] said Wednesday November 14 that the latest drilling results have expanded its Kamoa North copper discovery in the Democratic Republic of Congo. Ivanhoe shares rallied on the news, rising 4.44% or 11 cents to $2.59. The 52-week range is $4.32 and $2. A mineral resource estimate released in February 2018 states that Kamoa-Kakula contains an indicated mineral resource of 1.03 billion tonnes at 3.17% copper, or 72 billion pounds of copper, plus an additional 182 million tonnes of inferred mineral resources at 2.31% copper at a 1.5% cut-off. On Wednesday, Ivanhoe said exploration drilling on the Kamoa North prospect area has delineated two new, continuous corridors of shallow copper mineralization containing zones of thick, high-grade copper. Drilling highlights include DD1396, which intersected 18.26 metres (true width) of 5.73% copper, at a 1.0% copper cut-off, and 17.27 metres (true width) of 5.98% copper at a 2.0% copper cut-off, from a downhole depth of 233.60 metres. The newly delineated copper corridors occur on the western flank of the un-mineralized Kamoa Dome at Kamoa North. The most significant corridor trends north and south for more than nine kilometres before swinging to the northwest and is projected to continue onto the adjacent Western Foreland exploration licenses that are 100%-owned by Ivanhoe Mines. The second corridor trends west-southwest, away from the Kamoa Dome and towards the West Scarp Fault, over a distance of 3-4 km. “Our latest exploration success, at Kamoa North, provides additional options for mine planning and sequencing at Kamoa-Kakula,” said Ivanhoe Co-Chairman Robert Friedland. “The unparalleled strength and continuity of the high-grade mineralized trends on the Kamoa-Kakula Project also bode well for the potential of future success right next door, on Ivanhoe’s 700 km2 Western Foreland exploration licenses, north and west of Kamoa-Kakula,” he said. The high-grade Kipushi zinc-copper-silver-germanium mine is also located in the DRC. Sprott US Holdings President and CEO Rick Rule recently said he has shares of Ivanhoe “coming out of every available pore. I have never seen a company with this much geology going for it,” he said during the recent Cambridge International Silver Summit in San Francisco. However, he warned that the political risks associated with developing mining projects in the Democratic Republic of Congo means that people shouldn’t invest anything in Ivanhoe that the cannot afford to lose.